Persons affiliated with the University of West Florida(faculty, staff, and students) may request book titles to be added to the University Libraries' Kindles. The library staff will attempt to fill your request and contact you when the title is available on a Kindle for checkout. All available titles for the Kindle can be browsed/searched through Amazon. There is currently a $20.00 price cap for Kindle books. * For processing please allow 3-5 working days for book requests. Items are processed in the order received. 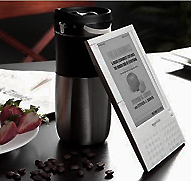 You may be contacted in the futured and invited to describe your experience using the Kindle. To eliminate form spam and hijacking by automated bots we use CAPTCHAS. For your form to be submitted please type in the text shown in the following box before submitting your form.